The keynote addresses at Adobe Systems’ MAX developer’s conference this past week in Los Angeles contained the usual spate of product intros and partner announcements, including Adobe’s plans to bring the Flash Player to most of the major smartphone platforms — RIM, Symbian, Windows Mobile, Google’s Android, and Palm’s webOS. Apple’s iPhone was, of course, conspicuously absent from the list of mobile partners. Most of this wasn’t news. As we reported at the time, Adobe CEO Shantanu Narayen announced that Adobe had successfully ported Flash Player 10 to four of these mobile platforms in an Adobe Systems earnings call back in June. The addition of RIM is the only real news in the announcement. What is new, however, is Adobe’s public stance regarding Apple and the iPhone. Frustrated by its inability to deliver Flash to the iPhone, Adobe has apparently decided to stop being coy and lay the problem squarely on Apple’s doorstep in a very public way. Evidence of Adobe’s more aggressive attitude was apparent throughout the conference. In Monday’s keynote Adobe debuted a video titled “MythHackers,” a parody of the MythBusters television show with Adobe CTO Kevin Lynch and Creative Solutions senior vice president Johnny Loiacono in the roles of the intrepid myth busters. Lynch and Loiacono read a letter from “Steve from Cupertino” who says he has heard that “it’s not possible to run Flash on the iPhone.” The myth hackers exclaim, “There’s got to be an app for that!” and set out to “hack” the myth. At the end of the clip, Adobe reveals what was perhaps the keynote’s biggest surprise: an upcoming version of Flash Professional will allow developers to use Flash and ActionScript to build native iPhone applications. In the video, the myth hackers triumphantly declare the myth about Flash on the iPhone “hacked.” But it’s not. 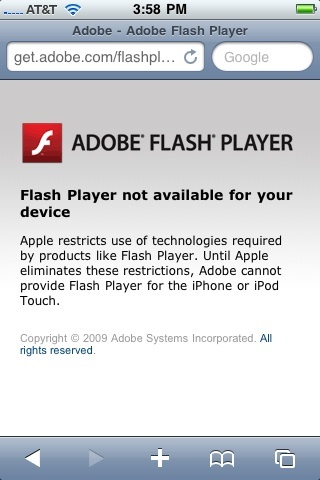 Adobe didn’t announce that Flash will run on the iPhone. The applications created using Flash Pro are native iPhone apps, not SWF files interpreted by the Flash runtime. While this may be a boon to Flash developers who want to code iPhone applications, it doesn’t resolve the issue of enabling the iPhone to access Flash web content. To a large extent the announcement was a political move to do something — anything — to have a story about Flash on the iPhone (even if it doesn’t actually involve Flash on the iPhone). This “in your face” attitude wouldn’t be surprising coming from most technology companies. An aggressive stance vis-à-vis competitors is common among high tech companies from Oracle and SalesForce.com to Microsoft, Google, and, yes, Apple as well. The key question about Adobe’s new tact is: Will it work? Does this approach make it more or less likely we’ll see Flash on the iPhone anytime soon? One can appreciate Adobe’s desire to clarify to its customers and developers what it sees as the source of the problem. Its bolder statements on the matter will help to achieve that goal. But it will also raise the ire of Apple and Steve Jobs. The word on the street is that Jobs holds a grudge for a long time. In this regard, Adobe’s approach may make a bad situation worse. The fact that the company has taken these steps — despite their political cost — indicates the depth of its frustration over this issue. Ultimately, Adobe’s strongest tactic is its mobile partnerships with everyone except Apple. Once the full version of Flash is available for RIM, Symbian, Windows Mobile, Android, and Palm’s webOS, it will leave Apple as the singular outlier. For Adobe and its partners, implementation is the best revenge. Screenshot of iPhone message courtesy of Tim Heuer. Used with permission. Kendall — nice job summarizing the keynote and Adobe’s new stance. Adobe must be at the end of their rope if they are poking at Apple like this. Especially doing it at their developer-centric conference Max. As Kevin Lynch points out Adobe really needs to get Flash on the iPhone to remain a top contender in web application platform space. But Apple has built their business model around controlling the delivery channel. Not only do they own the store so to speak, they decide which apps go up for sale controlling the quality of the market somewhat overall. Flash apps would lead to two benefits for end users that I can see. First and foremost is video. Flash video would be a huge win for users. It opens up a whole world of content that is blocked completely right now. The other win would be more/better media & games. Neither of these points is pushing people away from iPhone to another device. So I just don’t see Adobe having any leverage against Apple at the moment. In the end, Android devices have the potential to win out over the iPhone. Apple won out by changing the mobile game early. The Android app ecosystem will grow to match Apple over time. Stronger data networks and device variety will start to win some folks away from the iPhone. It will take time. But the recent Verizon – Google collaboration agreement is a huge step in that direction. It would be interesting if Adobe threw their weight fully behind another platform like Android. Marketing a series of mobile media/gaming devices would have some potential to knock Apple off their tower. Focusing on application development seems like a dead end. @davekonopka: Adobe is throwing its weight behind Android. And Symbian, RIM, Windows Mobile, and webOS. Adobe’s approach has always been to be a supplier of cross-platform solutions. Adobe wants to be the glue that binds together otherwise diverse platforms. This has been true of their work from PostScript through PDF, Flash, and AIR. This comment can be viewed as both another dig at Apple and as a statement of Adobe’s philosophy of success by partnering with many companies (echoing the statement by Bruce Chizen in the original post). Lynch reminded the audience of the early days of the PC, in which the IBM/Intel/Microsoft architecture, while arguably not as functional or as elegant as the Apple’s Macintosh, became the dominant platform because it was an open ecosystem. Lynch indicated that he believed mobile platforms will follow the same pattern — which would not bode well for Apple. This may be wishful thinking on Lynch’s part, but you never know. The arc of history is long. Adobe reveals what was perhaps the keynote’s biggest surprise: an upcoming version of Flash Professional will allow developers to use Flash and ActionScript to build native iPhone applications.